Warby Parker has been a buzz company for a while now in the U.S., but until recently, I thought my non-Brooklyn residence (and deep-set eyes) precluded me from partaking in the thick-frame takeover of my generation. Then I saw their co-founder, Neil Blumenthal, speak at the 2013 PSFK Conference and my whole opinion changed. “We wanted to show that you can build a profitable, scalable company that does good in the world, and not charge a premium for it,” says Blumenthal. Amen. Then he showed a slide that blew my mind (sorry for the janky screenshot, maybe you should get a new pair of glasses to see it better muahaha). 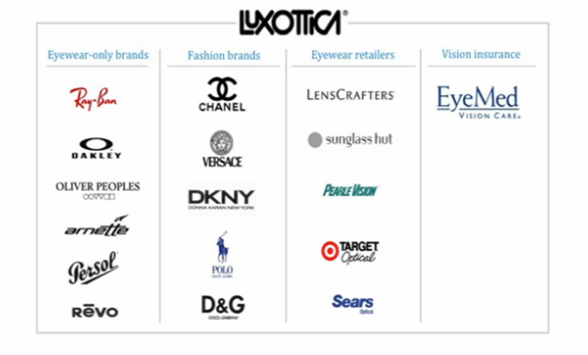 Further investigation revealed 60 Minutes had already done the whisteblowing on this one, and I missed the memo, but Luxottica Group has a total monopoly over your eyeballs. Being a classic millennial, I don’t love big, bad monoliths, so immediately after the conference I went to Warby Parker’s website to peruse. I was happy to see that the selection is not all Tinker-Tailor Soldier Spy thick frames (Google Images if you don’t get the reference and then please put the movie on your Netflix list). The selection was big, unisex, unlabeled and affordable. GIMME. As I was strolling, I came across a pair of sunglasses that reminded me of the ones I was coveting from Garrett Leight after seeing the movie Möbius at the Tribeca Film Festival. So I headed down to the Warby Parker store on Greene Street in Soho to try them on. I was blown away – not by how great I looked in the glasses (though I was happy with the look), but by the gorgeous store, great products, friendly millennial stafflings and super quick iPad checkout. Bliss. And for every pair of glasses purchased, Warby provides a pair to someone in need. Now that’s more for less. Warby Parker Greene Street store in Soho, Manhattan. Courtesy of Warby Parker.